The African Renaissance Monument is a 49 meter tall bronze statue built overlooking the Atlantic Ocean in the Ouakam suburb, the statue was designed by the Senegalese architect Pierre Goudiaby commemorating the 50th anniversary of the country's independence from France. 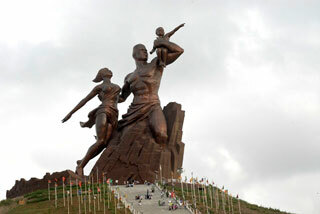 It is the tallest statue in Africa. This article uses material from the Wikipedia article "African Renaissance Monument", which is released under the Creative Commons Attribution-Share-Alike 3.0 License.